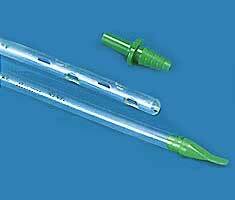 We have carved a niche as one of the most reliable Chest Drainage Catheter Manufacturers in India. The simple structure of the Closed-Chest Drainage Catheter has helped in the cardio thoracic and thoracic surgery. Customers are facilitated with the availability Chest Drainage Trocar Catheter of the standard size i.e. 45 cm and length that varies between 16FG to 36FG. Moreover, six smooth eyes at the end also help in the maximum drainage from the chest. As the chest drainage catheter is a perfect match to the norms set at the international level, various national as well as international clients are placing huge orders. For Post operative drainage after cardio thoracic and thoracic surgery. Cross side eyes to prevent tissue aspiration.